The main window consists of three areas, the password viewing area, type selection area, and the controls area. The viewing area consists of three sections, the password view, strength meter, and the info area. It shows the currently generated password. The password is either shown in black or highlighted. When the password is highlighted each type of character is shown in a different color. See preferences for more information. The password displayed can be edited and the strength will automatically update. Using this any password can have the strength calculated by typing or pasting it into the password display. Behind the password field is the strength meter. The strength meter will fill and indicate the relative strength via colors. Red is the weakest, green is very strong, and purple is super strong. Below is a list of the colors and the approximate 'crack time'. The strength level is only a guide, and will not assure your password won't be hacked. Below the password is the info area, which consists of three parts. To the right is the length of the current password. And below the password is the 'crack time' display. Clicking directly below the password will show or hide the display. Which shows the calculated time it would take to potentially 'crack' the password. At the bottom are two buttons, generate will generate a new password, and copy will copy the current password to the clipboard. 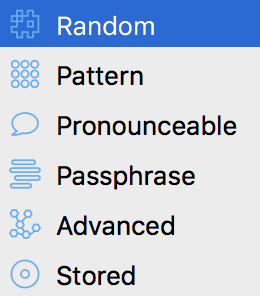 The type selection area allows for selection of the different password types. Clicking on an item will change the currently selected type. 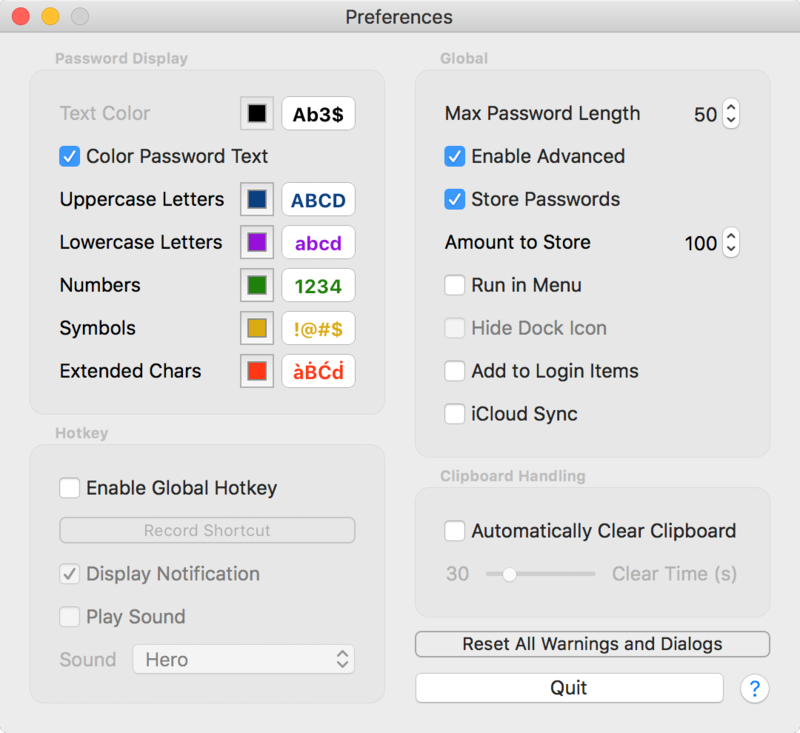 In addition to the four standard password types, two additional types, 'Advanced' and 'Stored' can be added from the preferences. See Preferences - Global for more information. The controls area displays the controls for the currently selected password type. This type will generate a random password based on the options selected. Enabling this will add random emojis to the password. See Emojis and Extended characters for more information. Changing the case type will change the case of letters that are used. See Case Types for more information. When typing in the pattern field any character not in the pattern list will be used as is. If you want to insert any of the pattern characters directly precede with a '\'. For example the pattern 'cC\C!w' will be a lowercase letter, uppercase letter, C, a symbol, and a word which would give a result like 'kWC!senseless'. 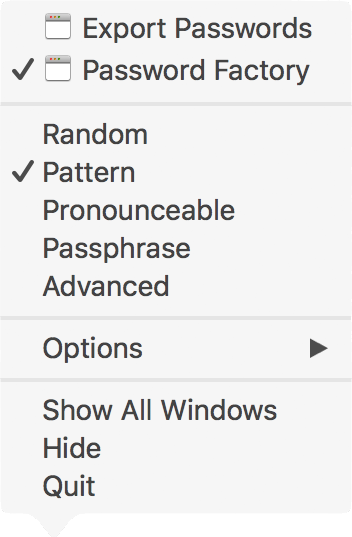 The pronounceable section will generate a random password by combining phonetic sounds to make pronounceable, but gibberish words. The length slider will set the approximate length for the password. The separator menu will change the separator that is used between words. And the case types menu will set the case type. The passphrase section will generate a passphrase style password. It will consist of a series of words separated by your chosen separator character. The advanced section allows for the transformation of the various password types to generate passwords that are not in a strict format. This section has seven different parts to fine tune the type of password generated. Enable this section in preferences. The source selection is to the upper left, and will set the base for the password. If nothing else is set it will generate a password exactly like the selected source. To the right of the source selection is the truncate slider, setting the truncation value will truncate the password to the selected length. Below the source selection is 'Replace Ambiguous'. This will replace any ambiguous characters with one that is less ambiguous. Below that is the transformation section, there are two options 'Symbolize' and 'Accenter'. Symbolize will replace characters with a random symbol representation of the character. For example, an A could be replaced by 4, /-\, @, ^, /\. Accenter will replace characters with accented and similar looking extended characters. For example a B could be replaced by ḃ, ɓ ,ḅ , ḇ. Both Symbolize and Accenter are set by changing the percent value. By putting it at a certain percent, it will replace approximately that percent of all characters. Setting both to 100% will only result in a 100% Symbolized password. To the right is the pattern section. The 'Prefix Pattern' will prepend the password with the pattern entered. The 'Suffix Pattern' will append that pattern to the password. The patterns use the same tokens as the pattern password. Below that is the regex section. This section allows for the addition of a single regular expression find and replace within the password. The regular expression allows for captures and other standard regular expression syntax. For a more in depth explanation of regular expressions see this site. This section displays all the stored passwords. Passwords will only be stored if 'Store Passwords' is enabled in preferences. See the password storage section for more information on stored passwords. The stored password table can be sorted by password type, password, or strength. Clicking on the headers will sort the passwords according to that column. By default it sorts by time created, with the newest on top. Pressing ⌘Delete when selecting a password will delete it from the system. When running in the menubar the application uses a more compact interface. The interface functions the same as when it is running normally, however items are rearranged. To select a password type use the control at the top of the window and click the icon to select, and the type name will show above the password display. The preferences window can be shown by clicking the gear icon on the bottom right. The widget is enabled via going to the notification center and clicking edit, and then you can add the "Password Factory" widget. The widget will generate passwords based upon the configuration of the Password Factory application. Therefore, if the 'Passphrase' type is set, then the widget will generate a 'Passphrase' password using the current settings. The widget can only generate and copy passwords, and if you wish to change the password type go back to the application by clicking the gear and change settings from there. The export function will create a CSV file containing a list of generated passwords. First choose which type to export. Choosing anything other than stored will generate a series of new passwords. Choosing stored will export all stored passwords. 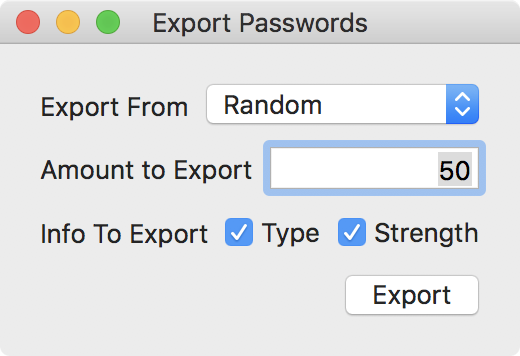 The number of passwords to generate is set by filling in the 'Amount to Export'. Additionally the 'Info to Export' options will add the password type and the strength to the CSV file. Clicking 'Export' will export all the passwords to a file of your choosing. Large numbers of passwords can take an extended period of time to generate. Clicking and holding on the dock icon will show the dock menu. Selecting one odf the password types will switch to that password type, generate a new password and copy it to the clipboard. The password display section controls how the password is shown in the app. If 'Color Password Text" is checked the characters in the password will be colored. Coloring the password text will enable you to easily distinguish between similar characters. You can change the color of each character type by clicking on the color boxes and selecting a new color. This section contains all of the global settings for the application. Sets the maximum length of the password sliders. This allows for longer passwords than the default. Checking this will enable the advanced password section. Enabling stored passwords will save generated passwords. Setting the amount to store will set the maximum number of passwords stored. When disabling stored passwords, all locally stored passwords will be deleted. If this is checked the app will run in the menu bar. If you enable or disable this feature, you will have to restart the app for the setting to be changed. You can also hide the dock icon while running as a menu bar application, but changing this setting will also require you to restart the application. Checking this will add Password Factory to your login items. In order for the app to be added to your login items, it has to be installed in Applications. Note: If you add to login items it will not show up in your Accounts preferences, however it will start on login if it is checked. Checking iCloud Sync will sync all your passwords and settings to iCloud and will be available to all your macOS and iOS devices running Password Factory. See iCloud Sync for more information. The global hotkey will allow you to set a key command to automatically generate a password and copy it to the clipboard. Now your global hotkey is set, you can press your key combination when in any app to copy a password to the clipboard. There are two options for the global hotkey. Checking 'Automatically Clear Clipboard' will clear the clipboard of your password after the 'Clear Time' has passed. If you use a clipboard manager this may not remove the password from your clipboard manager. The length of the password will always be shown to the bottom right of the password display. Occasionally the password length shown will differ from the slider length. This happens because the algorithm for passphrase and pronounceable passwords uses the length as an approximation. The length can be smaller or larger because it will not truncate a phonetic sound or a word to fit. If a password of a specific length is needed use the advanced password type, and set the truncate value to the length needed. Passwords have a strength from 0 to 100, with 100 being the strongest. Passwords with a strength of 50 and above are the strongest and should give you the best protection. The strength meter indicates strength with the size and color. Smaller widths are weaker, and larger widths are stronger. The color of the strength meter goes from red to purple, and below is a list of colors mapped to their strength and 'crack time'. Password strength and crack time should only be used as a guide. Creating a password that was indicated to be strong does not mean it is uncrackable. Password cracking and other techniques constantly evolve and no password is 100% secure. Ambiguous characters are characters that look similar to other characters. The list of ambiguous characters are "I1O0l0"
Symbolize changes individual characters into symbols that resemble that character. Setting the percent indicates that approximately that percentage of characters will be replaced. For example, at 50% about half of the characters will be replaced with the symbolized counterpart. The Accenter changes characters into extended characters. It will either be with accents, diacritics and hooks, or characters from other languages that look similar to the ones in the Latin alphabet. Setting the percent indicates that approximately that percentage of characters will be replaced. For example, at 50% about half of the characters will be replaced with the accented counterpart. Password Factory has support for emojis and extended characters. An extended character is a character that is not in the standard Latin alphabet, plus numbers, and standard symbolic characters. Although emojis and extended characters will create a stronger password, not all systems support using these characters. Always take caution when using emojis or extended characters and if possible test your password against the login system first. Alerts are shown when there is a warning about the current action, or there is an application error. Clicking 'Cancel' will stop the current action and return the application back to the previous state. 'OK' will continue with the current action, or simply dismiss the window. Some alerts can be hidden, by clicking 'Do not show this message again', that alert will not be shown again. iCloud sync can be enabled in preferences. Enabling sync will sync all preferences and stored password to iCloud. Both preferences and stored passwords will now be available to all devices using iCloud Sync. When initially activating sync all local preferences will be synced to iCloud. Then when activating on another device, local preferences will be overwritten with preferences stored on iCloud. Then all stored passwords will be merged with any passwords stored in iCloud. 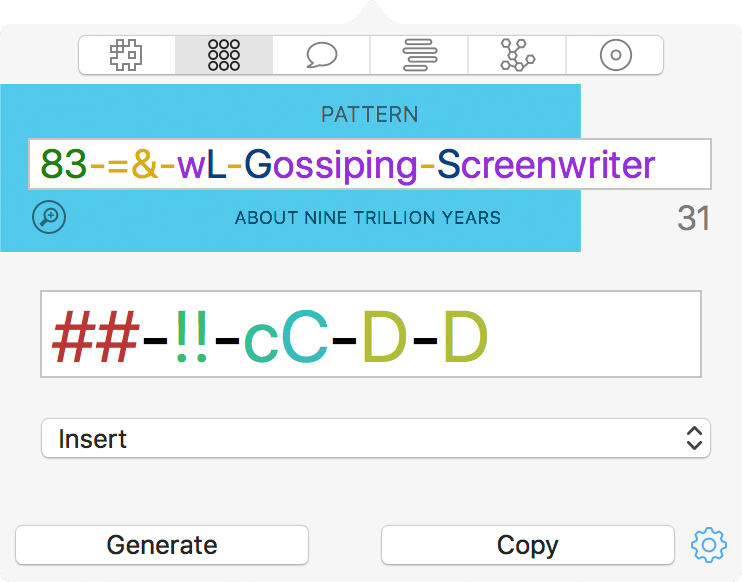 This will display when typing in the pattern field, pressing on a letter will insert that pattern character into the current pattern.